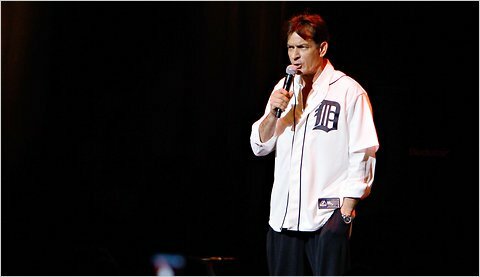 Charlie Sheen’s “My Violent Torpedo of Truth” tour began Saturday night at the Fox Theater in Detroit, Michigan, and according to several accounts, it was a total bomb. I guess his crazy act doesn’t translate to the stage. The disastrous event included an appearance by Sheen’s live-in “goddesses,” a Q&A session about his crazy life, film clips featuring father Martin Sheen and fellow actor Johnny Depp, as well as a live rap by Simon “Dirt Nasty” Rex. After less than an hour, Sheen left the stage and the house lights were turned on. The 20-city tour is scheduled for the rest of April. More details and video at: Charlie Sheen — Bombed in Detroit on TMZ.